Categories: News | 8th February 2017 | Author: darren | Comments (0). Mark Farrell (M.D.) and Tim Walker (Products Director) visited our long term key business partner, Muvtons Castors Pvt. Ltd in Noida, New Dehli to inspect their new factory facility in January 2017. The purpose built 137,000 sq ft production and office facility boasts of brand new plant and equipment comprising of Japanese CNC Machining Centers capable of precision machining castors and wheel components to extremely precision tolerances; Robotic and Special Welding machines capable of welding hundreds of thousands of parts to the same exacting quality and finish; Two Fully Computerised Polyurethane Casting lines, imported from Europe, capable of producing an extremely wide range of wheels from 40mm diameter to 1000mm diameter suitable for diverse and demanding applications in material hardness range from 55 Shore A to 75 Shore D; a Mechanical Press Line ranging from 60 tons to 400 tons capable of producing precision metal stampings from 0.5mm material thickness to 8mm material thickness plus a host of Assembly & Support equipment needed to produce absolutely the Best Quality of Wheels & Castors. The new facility is currently undergoing audits to obtain the latest ISO 9001:2015 and UL certification. Clear evidence of a comprehensive QMS is rigidly enforced with revised quality improvement procedures throughout the whole organisation. Since a new quality management team have been deployed, together with new working practices, new machinery, staff re-training, improved production layouts and the implementation of Kaizen philosophies, customers are receiving some of the highest quality heavy duty fabricated castor and wheel products that are available worldwide today. 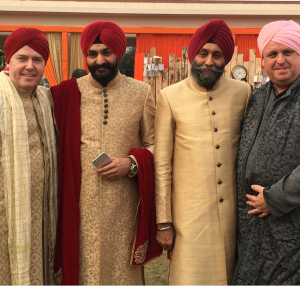 Whilst visiting New Delhi, were honoured to be invited to the three day wedding celebrations between Achint the daughter of Mr Amardeep Singh, Muvtons Managing Director and Gurmukh. 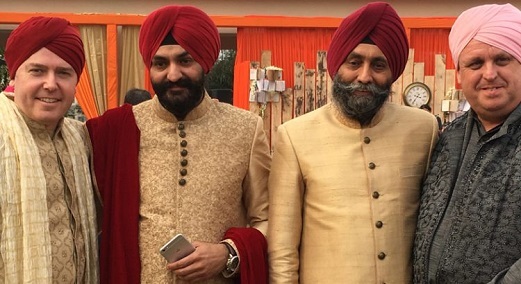 What an absolutely magical experience that turned out to be…a three day / night traditional Sikh wedding! We wish the happy couple a joyful and successful life together.